Puro— made from a single variety of grape, usually the traditional Quebranta. Aromatic— Again, made from a single variety, but usually on of the Muscat family. Mosto Verde (Green Must)—distilled from grape must, the crushed grapes including the solids called pomace that has only partially fermented and contains residual grape sugars. Acholado (Half-breed)—a blended of musts or wine from several varieties of grape. This is all particularly fascinating since all but one of the four or five piscos that I have found give any indication as to which category they belong. According to Imbibe, during the middle of the 19th century, there was extensive trade between San Francisco and Peru. This led to pisco being San Francisco’s top-selling liquor with the prospecting gold rush crowd. It however did not fare will after prohibition and so, until this article, I had never heard of the stuff. But that fact all the more piqued my interest, so being Wisconsin, we headed to one of the most bizarre liquor stores that I have ever been in, Club Liquor in Neenah-Menasha, WI. From the outside it looks like a seedy tavern-liquor store combo. Inside, while it isn’t what you might call a fin retail establishment, they have everything including a COUPLE of $150 bottle of Jonnie Walker blue label just sitting on the shelf. 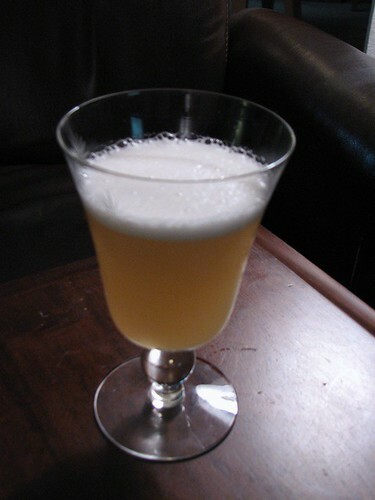 Well, I picked up a bottle of Don Cesar Pisco Puro and made a pisco sour for the family. All in all, everybody pretty much liked it. So, we decided to get some when we got back to California and picked up some Pisco Montesierpe, a venerable old brand. This cocktail uses an egg white to add body and froth to the drink. It really is quite good, but the egg white does tend to freak out many people. Just remember booze kills bacteria; lemon juice kills bacteria. If this doesn’t help, buy pasteurized eggs (and then don’t tell your guest until the second one). It is interesting, the Don Cesar had a less aggressive, less plant-like taste than the Pisco Montesierpe. Our Pisco Montesierpe reminded me a little of rhum agricole, which is made from cane juice rather than molasses. I don’t know type of Pisco it is, I am guessing it’s probably the acholado. If you know or want to hazard a better guess, leave a comment. I actually think that the Don Cesar makes a bit more balanced pisco sour. At any rate the Montesierpe has a more intense, though harsher flavor. Wow, I feel so knowledgeable now! I’m glad that Wisconsin is a source of interesting and fine items. I grew up there and pretty much only remember seedy taverns. People are so weird now about eggs. Honestly, these days spinach is more likely to kill you. I find that there is an interesting parallel between Wisconsin and California. When I got to California, I was amazed to find that greasy spoon diners often have a two page wine list and that seedy grocery stores have and isle and a half of high end wine, but hard liquor can be hard to find (at least the interesting stuff). In Wisconsin, you can’t necessarily get interesting wine, but the Piggly Wiggly has a dozen varieties of Hennessy and Courvoisier cognacs. I agree with you on the eggs vs spinach. With a couple of people that I know well enough, I have omitted the egg disclosure until they were well into the drink. It’s interesting the conflicted half-freak out that they have. One has to be careful about the audience when doing that though.